Lamarck at age 33 and later in life — from Alpheus S. Packard’s Lamarck, the Founder of Evolution (1901). In the immediate period after his death, history was not generous to Lamarck. The death notice in The Times paid no tribute to his considerable contributions to biology and conchology, concentrating instead on the delicate politicking behind the search for his replacement at the Jardin du Roi. In their annual summary of the year's dead, Fraser's Magazine noted that while Lamarck's name might have had some resonance in his heyday, his memory would soon be 'consigned to oblivion'. The insult was compounded by Fraser's evidently failing to notice that Lamarck had already been dead three years. He was included in their December 1832 summary. Lamarck was born at Bazentin-le-Petit, Picardy, on 1st August 1744. He was the youngest of eleven children, born to noble, if not especially prosperous, parents in rural France. 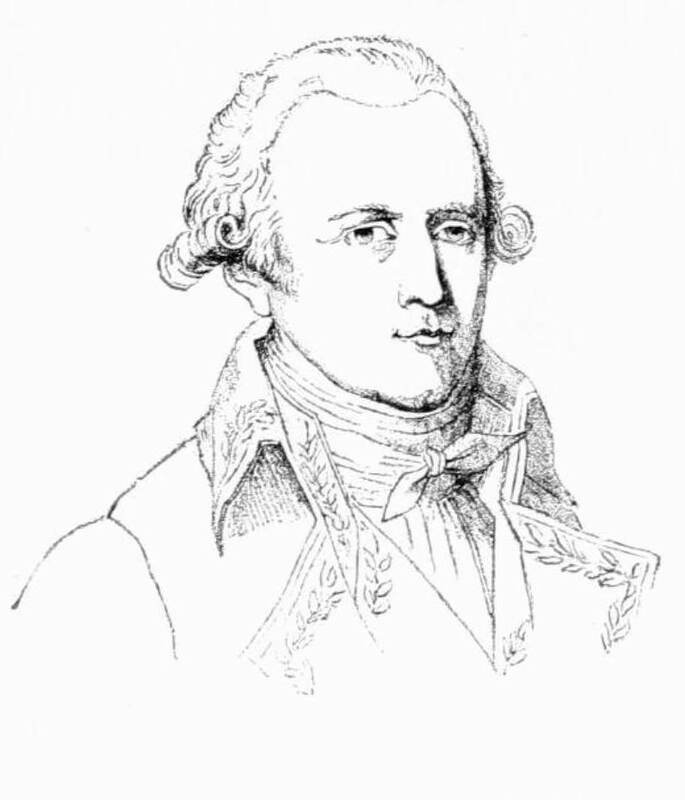 The family appears to have had a strong military background, with several generations serving as officers in the French army, and some of Lamarck's older brothers made their careers in the military. His father, Phillipe, expected Jean to take a career in the church. However, Jean was not inclined to the ministry, and when his father died in 1760 Lamarck quit his Jesuit college, bought himself a horse, and rode away to join the French army in their campaign near Fissinghausen, Germany. Unfortunately, the most widely reported incidents of Lamarck's military career depend ultimately on the testimony of his devoted daughter Cornelie, who may have had reasons for glorifying her father's role. Both should probably be judged skeptically. Cornelie first tells how the battle at Fissinghausen was a disaster for the French, with both French generals accusing each other of responsibility for the defeat before leaving the field. Lamarck's company was left exposed to the direct artillery fire of their enemies, and was quickly reduced to just fourteen men - with no officers. One of the men suggested that the puny, seventeen year-old volunteer should assume command and order a withdrawal from the field; but although Lamarck accepted command, he insisted they remain where they had been posted until relieved. When their colonel reached the remains of their company, this display of courage and loyalty impressed him so much that Lamarck was promoted to officer on the spot. His departure from military life, as it was reported, was as remarkable as his elevation within it. He quickly became a lieutenant in command of a garrison stationed at Monaco. It was peacetime, and the soldiers were indulging in some kind of physical game for relaxation, when one of the men lifted Lamarck off the ground by his head. This practical joke caused serious inflammation of the lymphatic glands in the neck, and Lamarck had to be taken to Paris for further treatment. But surgery, if anything, only made the injury worse, and Lamarck was decommissioned. Finding himself suddenly reduced to a measly military pension (400FF a year), he fell back to studying the natural sciences which had formed part of his instruction at college. The title-page of Lamarck’s botanical encyclopedia (1783) — courtesy of the Smithsonian Institution and Archive.org. A spell in an office gave him the means to read botanical works and, with his brother, eventually to study medicine. But he became more and more enamoured with the natural sciences, finally abandoning medicine - as he had discontinued at an early stage careers in the church, the army, the bank and in music - for botany. 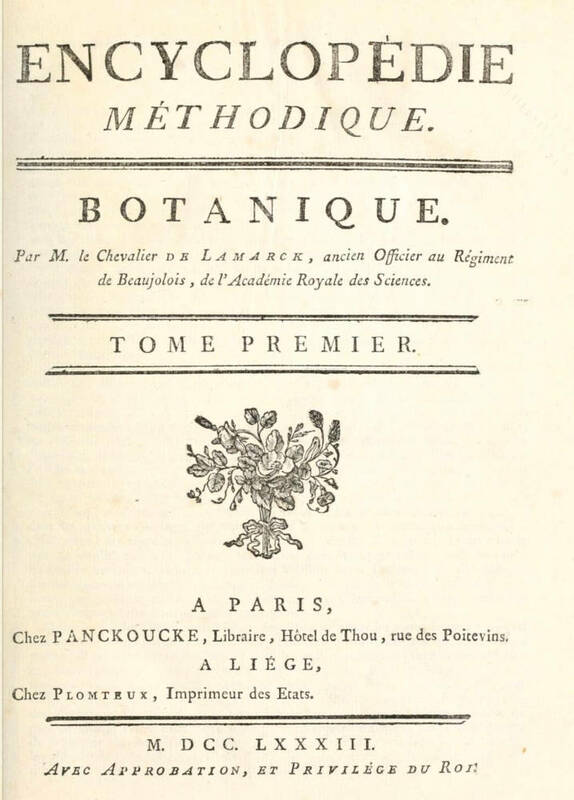 At the age of thirty-four, after studying botany for ten years, he succeeded in having his Flore Française published, albeit with the help of the great botanist Buffon. This volume brought him great acclaim, and remained a standard work for many years. He found himself mixing in the premiere league of French botanists, and was elected (again, owing to Buffon's patronage) to the prestigious French Academy of Sciences the following year - in preference to scientists with much longer careers behind them. He toured Europe in search of new botanical specimens and returned to keep the Royal herbarium at the Jardin des Plantes. It was a poorly-salaried position, requiring Lamarck to teach, in addition to the work he did in the herbarium. In the years that followed Lamarck continued his research, studied shells, produced various works on botany, physics and meteorology, and faithfully attended meetings of the Academy right up until the time ill health forced his retirement. 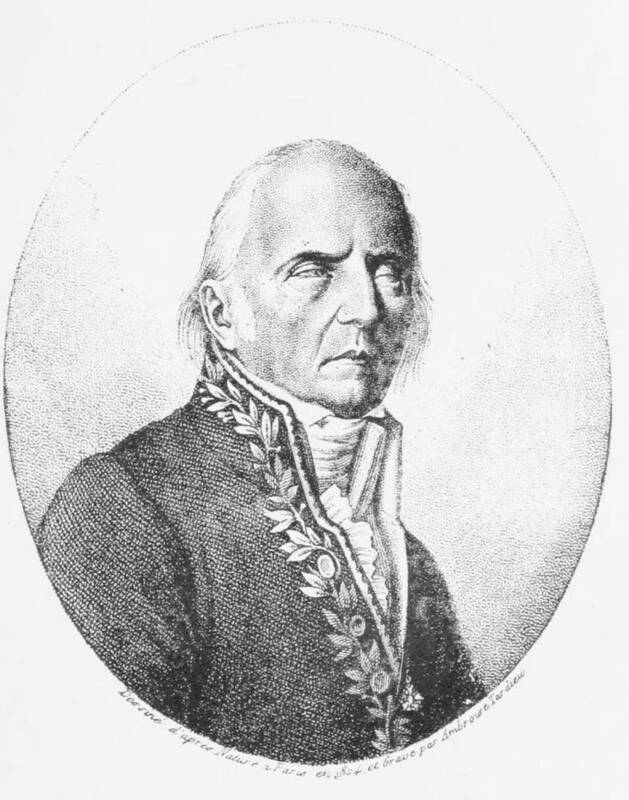 He was instrumental in the 1793 reorganization of the Jardin des Plantes into the French Museum of Natural History, and he was appointed one of its professors in 1794. He was put in charge of insects and worms, a field in which he was far from specialized. Despite this lack of expertise, Lamarck committed himself to learning everything he could about invertebrates (a term Lamarck coined), and to categorizing the Museum's vast and disorganized collection. His system of dividing and subdividing the organisms according to type set the standard for later systems of invertebrate taxonomy, and has by no means been discarded. Discovering, as he carried out this work, that animals varied by sometimes minute degrees, Lamarck began to formulate new ideas about the relationships between animals, and then about the transmutation of species into new ones. In 1809 he published his most famous work, Philosophie Zoologique. This volume describes his theory of transmutation. The theory that Lamarck published consisted of several components. Underlying the whole was a 'tendency to progression', a principle that Creation is in a constant state of advancement. It was an innate quality of nature that organisms constantly 'improved' by successive generation, too slowly to be perceived but observable in the fossil record. Mankind sat at the top of this chain of progression, having passed through all the previous stages in prehistory. However, this necessitated the principle of spontaneous generation, for as a species transformed into a more advanced one, it left a gap: when the simple, single-celled organisms advanced to the next stage of life, new protozoans would be created (by the Creator) to fill their place. But the overarching component of Lamarckian evolutionism was what became known as the inheritance of acquired characters. This described the means by which the structure of an organism altered over generations. Change occurred because an animal passed on to its offspring physiological changes it had undergone in its own lifetime, and those changes came about by its responding to its survival needs. The long legs and webbed feet of wading birds, for example, arose when those animals' ancestors responded to a need to feed on fish. In their attempt to wade in deeper and yet still keep their bodies dry, they would unconsciously adopt the habit of stretching their legs to their full extent, making them minutely longer in the process. This trait would be passed on to the next generation, who would in turn stretch their legs, until over many generations the wading birds' legs became those of the pelican. As the longer-legged birds waded deeper, it would be the habit of spreading the toes in order not to sink into the offshore mud, stretching the skin inbetween, that would eventually give rise to webbed feet. Conversely, the disuse of an organ would cause it to wither and disappear, which explained how snakes lost their legs. Although no part of Lamarck's theory of acquired characters has not been substantiated by modern knowledge of genetic inheritance, the process was an ingenious interpretation of observable detail. 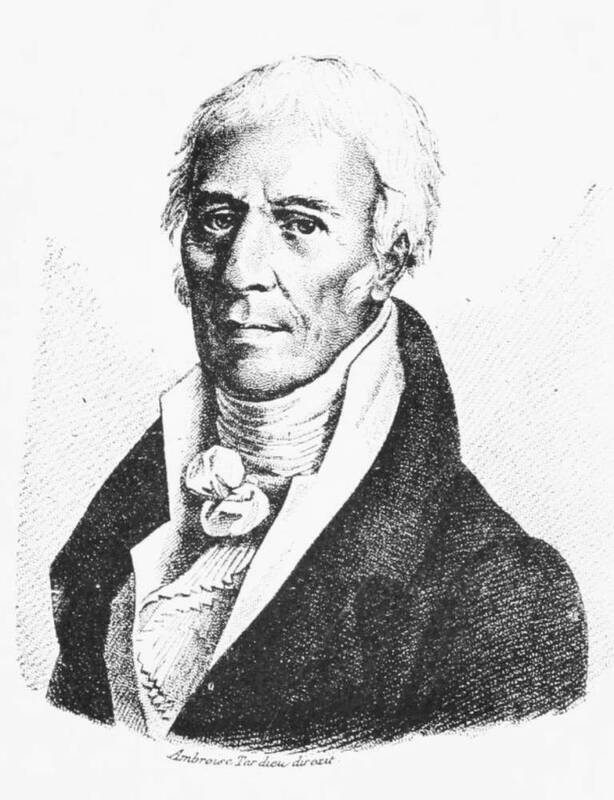 Lamarck when old and blind in the uniform of the Institute — from Packard. Lamarck's theory was not generally accepted in his lifetime, and Georges Cuvier (1769-1832), his colleague at the Museum, appears to have done as much as he could to undermine Lamarck and any ideas about transformism. For whatever reason, perhaps owing to an unwillingness to accept scientific innovations, Lamarck found little respect among his peers. Cuvier was revered from all sides, yet Lamarck could count only Geoffroy Saint Hilaire among his eminent friends. He retired from his botanical works when his eyesight deteriorated seriously in his seventies. In the last ten years of his life, blind, penniless and removed from all scientific activity, he was entirely in the care of his daughter. When he died, on 18 December 1829, his family were so poor they had to apply to the Academie for financial assistance. Lamarck's books and the contents of his home were sold at auction, and he was buried in a temporary lime-pit whose remains were exhumed every five years or so, to be piled up in the Paris catacombs, anonymously and without dignity, alongside those of the impoverished, vagrant, and unnamed dead. Lamarck had a curious personal life, of which surprisingly little is known, when compared with other French scientists of the time. He only married Marie Delaporte, the mother of his first six children, on her deathbed in 1792, after being together since 1777. He married again in 1795 (his second wife, Charlotte, died in 1797), and again to Julie Mallet (d.1819) in 1798. He is rumoured to have married (and been widowed) a fourth time, but no documentary evidence exists to support this. The two daughters who tended his deathbed were left penniless at his death; one surviving son was deaf and incapable and another was insane. Only one son, Auguste, was financially successful as an engineer, and only he went on to marry and have children himself. Section on Lamarck in "Darwin's Ancestors: The Evolution of Evolution"
Barthélemy-Madaule. Lamarck,The Mythical Precursor. Cambridge: Harvard University Press, 1982. Bowler, Peter J. 'Lamarckism' in Keywords in Evolutionary Biology. Eds. Evelyn Fox Keller & Elisabeth A. Lloyd. Cambridge: Harvard University Press, 1992. Burkhardt, R. W. 'Lamarck. Evolution and the Politics of Science.' Journal of the History of Biology 3 (1970): 275-96. Burkhardt, R. W. 'The Inspiration of Lamarck's Belief in Evolution.' Journal of the History of Biology 5 (1972): 413-38. Burkhardt, R. W. The Spirit of System: Lamarck & Evolutionary Biology. Cambridge: Harvard University Press, 1977, 1995. Useful history of events around publication of Lamarck's Philosophie Zoologique. Cannon, H. Graham. Lamarck and Modern Genetics. Manchester: Manchester University Press, 1959. Corsi, Pietri. The Age of Lamarck: evolutionary theory in France 1790-1830. Trans. Jonathan Mandelbaum. Berkeley: University of California Press, 1988. Gershenowitz, Harry. 'Whitman and Lamarck'. The Walt Whitman Review 25 (1979): 121-23. Gershenowitz, Harry. 'Two Lamarckians: Walt Whitman and Edward Carpenter.' Walt Whitman Review 2:1 (1984): 35-39. Gershenowitz, Harry 'Jack London: quasi neo-Lamarckian' Jack London Newsletter 11 (1978): 99-107. Gillispie, C.C. 'Lamarck and Darwin in the History of Science.' in Forerunners of Darwin.. Eds. Glass et al. pp.265-91. Gillispie, C.C. 'The Formation of Lamarck's Evolutionary Theory'. Arch Internat History of Science, 9 (1956): 323-38. Greenfield, Theodore. 'Variation Heredity: the evolutionary theories of four American neo-Lamarckians.' PhD thesis, Wisconsin 1984 (Alpheus Packard, Alpheus Hyatt, Edward Drinker Cope, John Ryder). Hodge, M.J.S. 'Lamarck's Science of Living Bodies'. British Journal on the History of Science 10 (1971): 323-52. Hutton, Frederick W. Darwinism and Lamarckism: Old and New: Four lectures. (1899). Jordanova, L.J. Lamarck Oxford, 1984. Excellent little book covering Lamarck's thought from his earliest publications. It is particularly good in recognizing how Lamarck's name has been tied so exclusively to the concept of the inheritance of acquired characters, a concept which in its misunderstood form works to the discredit of Lamarck, it looks sympathetically at his other scientific thought and his considerable and lasting contributions to biology. Lamarck did considerable pioneering work on physics, chemistry and meteorology. Following a roughly chronological format, Jordanova follows the development of Lamarck's scientific thinking, in particular his transition from believing in the fixity of species to a belief in transformism. She pays particular attention to Lamarck's thought in its scientific context. Lamarck, J.B. Philosophie Zoologique (1809). Trans. Hugh Elliot as Zoological Philosophy: An Exposition with Regard to the Natural History of Animals with introductory essays by David L. Hull and Richard W. Burkhardt Jr.,. Chicago: University of Chicago Press, 1984. McKinney, H. ed. Lamarck to Darwin: Contributions to Evolutionary Biology. Kansas, 1971. Packard, Alpheus S. Lamarck, the Founder of Evolution: his life and work. New York, 1901. Packard has marshalled a good deal of the information extant at the turn of the century, and his volume can be used as a base for most work on Lamarck, but there are inevitable gaps. Also rather hagiographic. Pfeifer, Edward J. 'The Genesis of American Neo-Lamarckism'. Isis 56 (1965): 156-67. Secord, James. 'Edinburgh Lamarckians: Robert Jameson and Robert E. Grant'. in Journal of the History of Biology 24 (1991): 1-18. This paper looks at the common attribution of one of the earliest articles praising Lamarck and the transformation theory -—'Observations on the Nature and Importance of Geology' appearing in the Edinburgh New Philosophical Journal 1 (1826): 293-302. Loren Eisley first attributed it to Robert Grant in 1958 (in his Darwin's Century), since when the attribution has been repeated by Bowler, Desmond, Corsi, Gruber and Rupke. Secord notes that there is no contemporary evidence for Grant's authorship, and no powerful case for it has ever been made. The strongest case comes from Grant's entry in the DNB, and the fact that Grant was easily the most renowned Lamarckian in Edinburgh at the time the article was written. Secord's argument is that the true author of the article is the Journal's editor, Robert Jameson. He discusses the arguments against Jameson sympathizing with a Lamarckian view, but suggests that Jameson has been badly judged. By looking at three factors - which Secord notes were the criteria behind attribution when the Wellesley Index was being compiled - the evidence points much more to authorship by Jameson than by Grant. The three guidelines are (1) the aims of the essay, considered in the context of Jameson's other works of the mid-1820s; (2) the context of the article as a whole; and (3) specific textual parallels with other writing known to be written by Jameson and Grant. Stocking, G.W. 'Lamarckism in American Social Science: 1890-1915'. Journal of the History of Ideas 23 (1962): 239-56.